Maybe I’m secretly glad most of ya think you are social media whores too. I don’t feel as online ridiculous…real life ridiculous I can handle I guess. Not that I am saying I’m not. Anywho-I know this is way late but I am way late. Last Wednesday, I posted a proposition if anyone could figure what my acronym meant. Well I have decided on a few winners because really all of them fit and none of them were lies and I wish I was as creative as you guys. So please email me at lolzthatswim@gmail.com and I will send you some pancake mix. I plan on sending orange zest but if that isn’t your jive please let me know. I mean I guess I can accept my favorites-aren’t everyone elses. 😉 And hopefully I will get arrested for sending white powder through the mail. Uh anyways. So I am back this week on the What I ate Wednesday Jivey Jive because I have nothing else to post about. Just kidding-my life is oh so thrilling. So here is what I ate/did/wore. Basically if your name was Hollie and you loved pancakes welcome to my life. This morning I woke up at 7:30 and made myself a chocolate waffle with peanut flour using this recipe. Topped with yogurt and syrup, it gave me some energy for great workout at 9:30. I actually wasn’t very motivated to workout today at all. I went to a legit swim practice last night (go team go) and so I was tired as fuuuuh (pancakes). So I put on my special hot pants and went to the gym. I wear them when I need extra motivation to get my booty to the gym. I don’t normally look cute at the gym because I’m not trying to impress anyone but this is as far as I go. That shirt incase you wondered says “protect this house…I will”. I kind of love it. Everyone should have hot gym hot pants. True life. An hour of Arctrainer+weight lifting+Abs and then I called it a day and went to Farmfresh to get a salad. This salad weighs 2.14 pounds. And I dominated it. Filled with fake crab, onions, lettuce, corn, everything from the Greek bar, mozzarella cheese, and possible some veggies. I’m not really sure if you can call it a salad but I just know it’s the bomb.com. 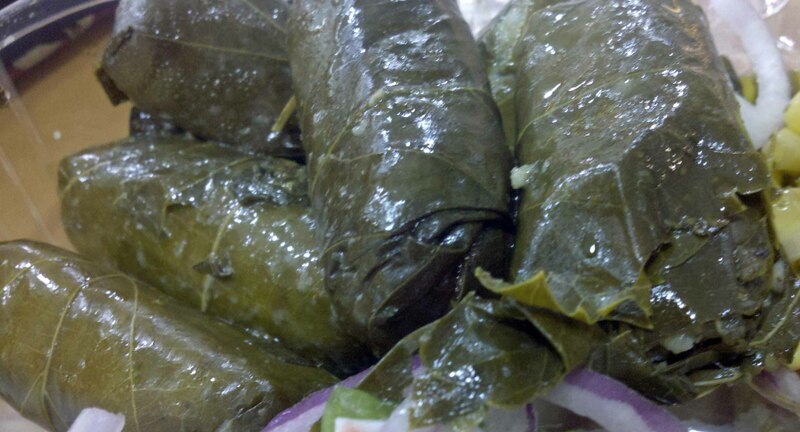 Grape leaves deserve their own personal photo. I’m seriously addicted to these guys. After lunch, I needed to run a few personal errands for the mom. Not going into work at the Cav generally means running around and still never really sitting still. I love it though. No buys for me today though-not like I need anymore clothing. Sadly. Although-I do owe you guys a blog about all my back to school shopping. I have gotten a good amount of random things to make me more realgirlesc. Then after errand running, I just chilled at home and relaxed and painted. I’m actually working on a large 3 feet by 3 feet canvas. I’ll post pictures eventually. 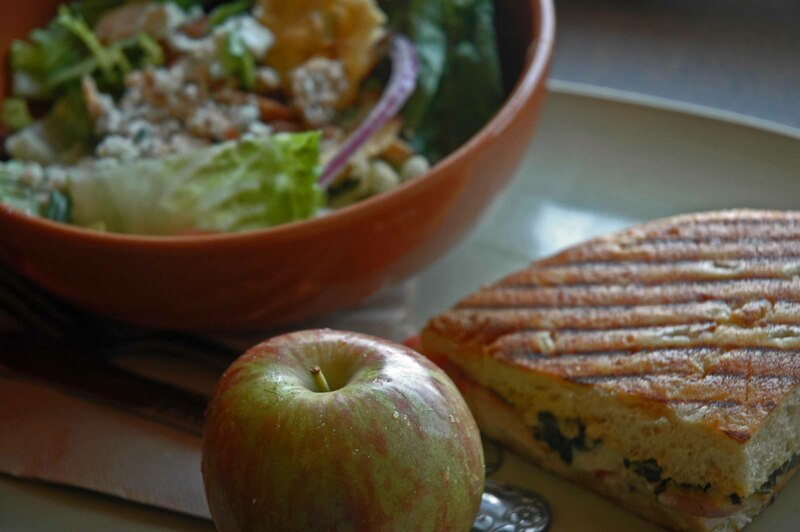 Dinner tonight was at Panera with aDuBs after some shopping. Anna seriously keeps me in check. I mean anyone that would tell me this shirt is okay (even if it was only 5 dollars) is straight off USS Cray Cray. Reason number 5000 Anna and I besties is that she won’t beat around the bush if the clothes don’t look good. It deserves a fuhh no.No really. I hear men did this peacock shouldered look. Well I’m ending early because the mom just asked if I wanted Coldstone and that is most certainly a yes (insert a few four letter words at your leisure). Peace out. What did you do today? What would happen if you wrote a blog timetable of your day? What is your favorite flavor at Coldstone? Um not a flavor-but birthday cake remix with extra cherries and brownies and no fudge. I have been getting that combo since I moved to the US and I will never convert. Um, so today, I woke up at 5:15 and ran 12 miles. Then I went to an all day meeting where I had to give a presentation. But, to get in my necessary icing, I wore icepacks strapped to my legs on the metro ride to the meeting. Rocking fashion. And by “5:15” i mean “4:15” which is so ridic that I can’t type it. I hope you got some sleep girl! I saw your run on DM and I thought you must have woken up hella early. Where did you live before the US? This is news to me and I am intrigued. I want some chocolate waffles…like…right now. Send some to me please and thank you! I love Cold Stone but unfortunately I haven’t been there in FOREVER! I love birthday cake remix. Awesome. Nice hot gym pants! ! A time table of my day would look kind of sad. Swim practice, animal feeding, schoolwork, lying on my bed being utterly exhausted from lack of sleep and watching cheesy mermaid shows on netflix. Hopefully I can get caught up on sleep/adjust to 4am wakeups so that I can actually DO something other than fall asleep all day! I’ve never been to Coldstone (gasp). I don’t even know where the closest one is to where I live now. Oh my goodness, Panera and Coldstone in one day?! AMAZING! that’s like my dream day right there! And I don’t think I can pick a favorite flavor…I love Reese’s cups and cookie dough in cake batter a lot though! That waffle looks super yummy :). And I love the tank top! Under Armor is awesome but I only have the cold stuff not their tank tops or anything like that. 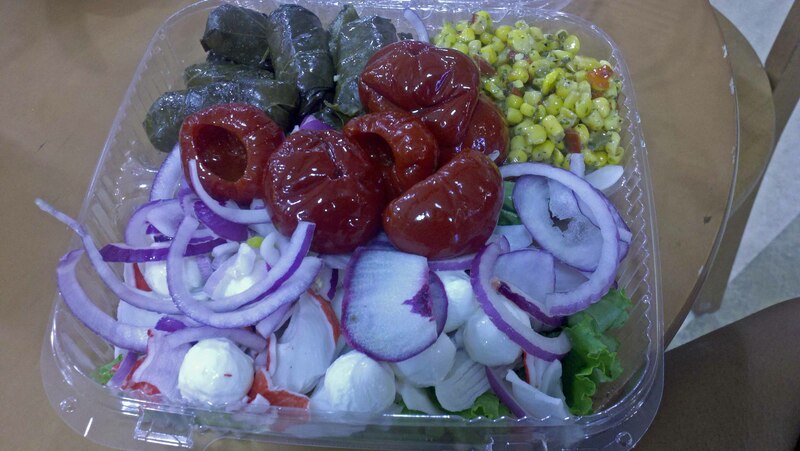 I’ve never heard of a Farm Fresh but Grape Leaves and everything Greek food is amazing! That waffle looks really good! I didn’t know that you lived in another country before the U.S.? Where did you live? I love cake batter and mixing it in with cookie dough, peanut butter, kit kats and twix. YUM!! I just wish I would not get horrible stomach aches after I ate it all lol. Sorry to ask this, but are you at a healthy weight? You look extremely underweight in that picture :(. Like BMI 15/16. Thank you for your concern Jenna, but I am healthy weight and my BMI is at a 20. I hate to chat about it on the blog, but your email bounced back. I’ve been obsessed with waffles lately and I was clicking around your site to try and figure out what recipe you use. Now that I know one, I can live in waffle-y bliss. thank you for that. I’m not a huge fan of coldstone. I used to love the cake batter with cinnamon, graham crackers, and bananas. Buuut the last time I had it I felt really sick afterwards so I’ve been turned off by coldstone for a while. Me thinks it’s time to rekindle my love. Cold Stone is so Kickasss!!! I love it there! Sweet Cream is amazing! Its like vanilla on steroids! SO CREAMY AND DELISH! And I am so happy I won!! So what actually did the letters stand for? I’m curious! I’m glad to find out that acronym..I really had no idea! I was just at cold stone a few weeks ago and tried the sinless cream with toffee and graham cracker. So good! I was impressed how tasty it was especially since I got the ‘low fat’ ice cream. Those shorts are SOOO cute–you look great!!!! I often post about my day as a timetable and am impressed that I have some readers, because my life is pretty boring hahah. I’m so jealous you have peanut flour! I’ve been meaning to get it but I haven’t made a trip to TJ’s in awhile! My day was pretty ordinary (up early/worked out/read/ate) but I do have an early birthday dinner tonight with friends! So what was the pancake flavor you made us guess last week? The one I got wrong? And what did you get at Coldstone… the usual you just described above? A timetable of my day would be super boring. Basically it would be get up after snoozing the alarms for at least a half hour (usually more), work all day, eat dinner once home, veg on the couch reading or watching TV (maybe both at the same time? ), go to bed. Like I said, boring! and you’re a champ with those shorts. no way would I rock those. but I would want to. I’ve only been to Coldsotne once and it was years and years ago. 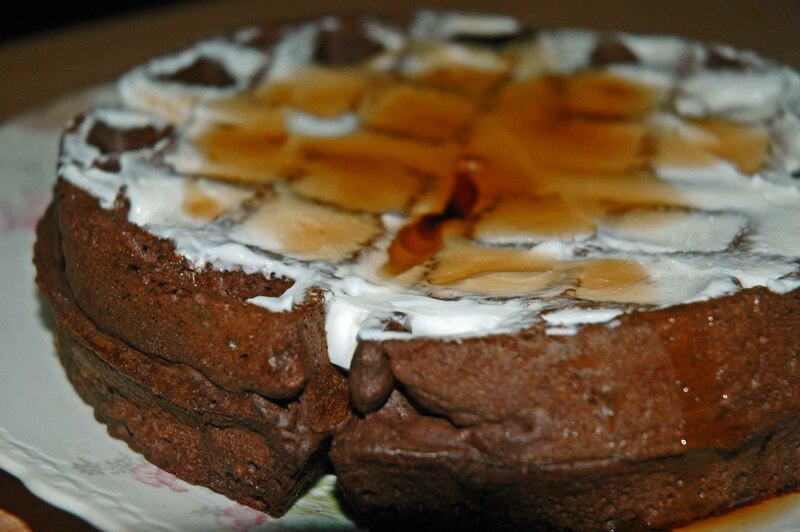 I remember it being ultra good though and I had starberries and marshmellows in my creation! Coldstone!! My favorite flavor is def. french toast! Do you eat Grape leaves just straight up? I haven’t been to Coldstone in forevs, but I love cake batter ice cream with cake (natch) and strawberries mixed in.